Leverett Town Hall is located at 9 Montague Road, Leverett, MA 01054; phone: 413-548-9150. 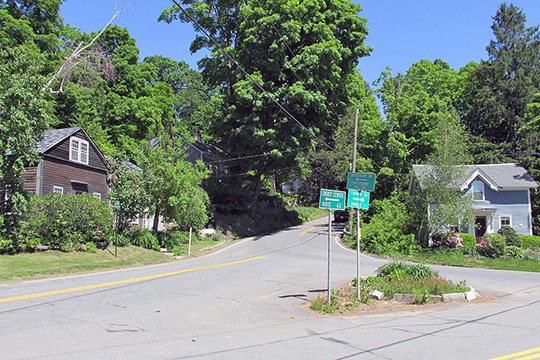 Photo: Intersection of Shutesbury and Cushman Roads, East Leverett Historic District, Leverett, MA. The Historic District was listed on the National Register of Historic Places in 2014. Photographed by User:John Phelan (own work), 2013, [cc-by-3.0 (creativecommons.org/licenses/by/3.0)], via Wikimedia Commons, accessed July, 2014. The Town of Leverett is one of the southernmost towns of Franklin County, located west of Shutesbury and Wendell, east of Sunderland, south of Montague, and north of Amherst. Leverett was originally part of Sunderland (named Swampfield at that time), but in 1774, Leverett successfully petitioned the colony for separation from Sunderland and was named for John Leverett, an early Governor of Massachusetts, who stood strongly against religious persecution and British rule. The town topography is made up of moderate to rugged uplands arising from the eastern side of the Connecticut River Valley, with the highest elevation of 1,260 feet at Brushy Mountain, located in the east-central part of town. The northern part of Leverett drains into the Sawmill River, which flows northwest into the Connecticut River, and central and southern Leverett drain into either Long Plain Brook or Roaring Brook. The town's only fresh water body is Leverett Pond, located in the south-central part of town, which probably served as a prime spot for native fishing and hunting. It was also an important water source that influenced colonial settlement patterns and supported the first village in town, Leverett Center. Colonial settlement was limited, with most occurring in the mid 18th century, much of it the result of the expansion of Sunderland into parts of Long Plain and Leverett Center. The Town's first meeting house was completed in Leverett Center in 1776. Late colonial settlement occurred in North Leverett, the site of a small community of Baptists, as a result of expansion from Montague. Agriculture was a primary occupation of colonial residents focused around the Leverett Pond area and elsewhere through town, although good soil for agriculture was limited. However, the elevations of the Sawmill River and Roaring Brook supplied power that was utilized to establish early industrial villages that provided a substantial contribution to the economic livelihood of Leverett. In the 19th century, factories, mills and shops along the Sawmill River in the north and along Roaring Brook in the east supplemented self-sufficient farms in producing the goods, tools and services needed in the area. Mills and factories in Leverett included grist mills, fulling mills, sawmills, blacksmiths, machine shops, scythe factories, box shops, a tannery and stills. Remains of dams and foundations of these early enterprises remain today. The 19th century saw the development of charcoal production in kilns. There are remnants of these kilns on Brushy Mountain and the last intact kiln in town remains along the Sawmill River. General stores were operated in each of the four community centers, with the Watson General Store in Moores Corner the largest in the county. At the turn of the 20th century, life changed in Leverett with the arrival of the railroad, electricity and the automobile. World War I followed and jobs in cities, military service, and ease of transportation made self-sufficiency unnecessary and impractical. The large, historic homes increasingly housed an aging population. The end of World War II brought an influx of returning veterans, drawn to the area by the expansion of the University of Massachusetts in Amherst. The number of students and faculty increased, which resulted in population growth in Leverett as many large, old houses were both available and affordable. Massachusetts Department of Conservation and Recreation, Franklin Regional Council of Governments, Pioneer Valley Planning Commission, Leverett Reconnaissance Report, 2009, www.mass.gov, accessed July, 2014.